If you’ve ever wondered about driverless cars and wanted to test one out for real, this weekend is your chance to take a true glimpse into the future of transport. As part of At-Bristol Science centre’s ‘What If’ festival – a six-week celebration of what it is to be curious – Bristol City Council and the Bristol Robotics Laboratory (BRL) will be showcasing the latest driverless vehicle technology developed by the VENTURER and GATEway projects for free from today until Sunday in Millennium Square. The VENTURER and GATEway projects aim to explore the public perception and understanding of Connected and Autonomous Vehicles (CAVs). Both are using virtual simulations and physical test beds in order to better understand the legal and technical challenges of implementing automated vehicles in urban environments and to further shape and inform public policy – with events such as these going a long way in terms of gaining valuable feedback from the public. 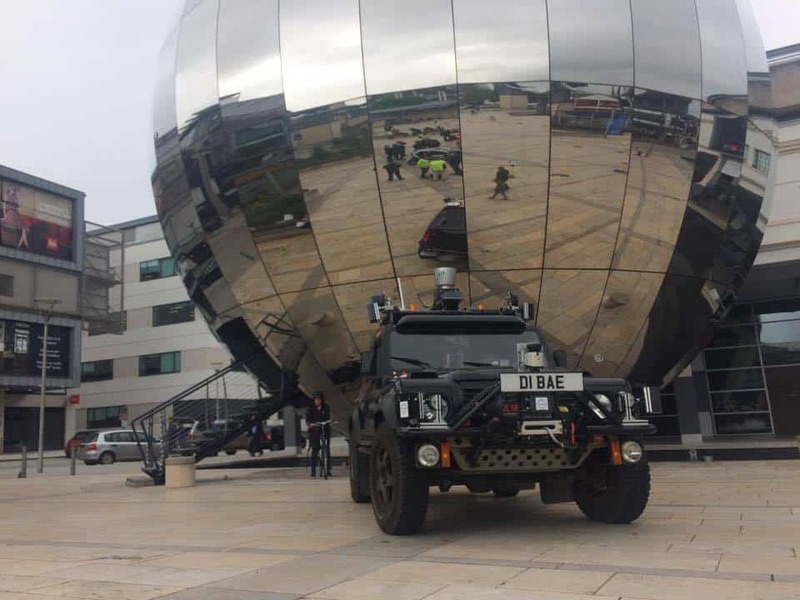 VENTURER is also testing autonomous technology on real roads using the autonomous Wildcat vehicle (pictured left in Millenium Square). The event will demonstrate the GATEway driverless pod, which has been equipped with a state-of-the-art control system with 3D imaging and location sensors developed by Bristol-based Fusion Processing ready for testing in a real-world setting in Greenwich, London this coming Autumn. These sensors enable the pod to navigate and avoid obstacles without the assistance of a driver. 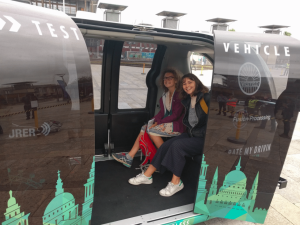 The TechSPARK editorial team had a ride around Millenium Square just yesterday (pictured right) as the At-Bristol event prepared to launch – testing out the pod’s ability to skirt around traffic cones and stop at designated ‘pod stops’. For anyone who’s a little nervous about giving it a go, you’ll be pleased to know the pod performed like a dream. In addition, the BRL has brought in a Renault Twizy to the event which has been modified to allow for autonomous driving to see how the type of driverless technology currently being developed by VENTURER can be applied to other vehicles in the future. 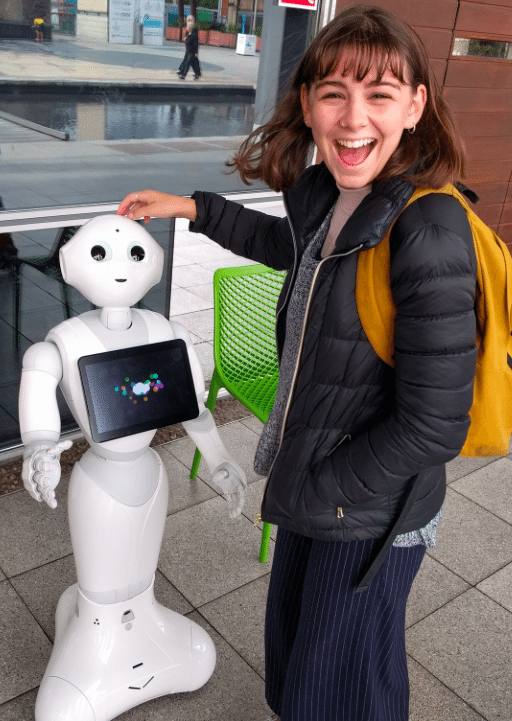 Also present at the event is Pepper, a programmable humanoid robot that can recognise human emotions, who’ll be on hand for the public to chat to and interact with. In fact, our writer Shona had a great time simply tickling Pepper’s head to see how it reacted (pictured left). 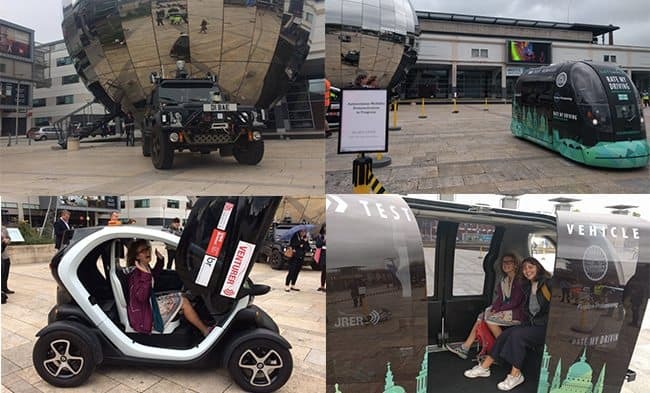 The driverless cars exhibition is free and will be held in Millenium Square from 10am- 4pm Friday 4 – Sunday 6 August. To find out more about the festival of ‘What If?’, check out the At-Bristol website. 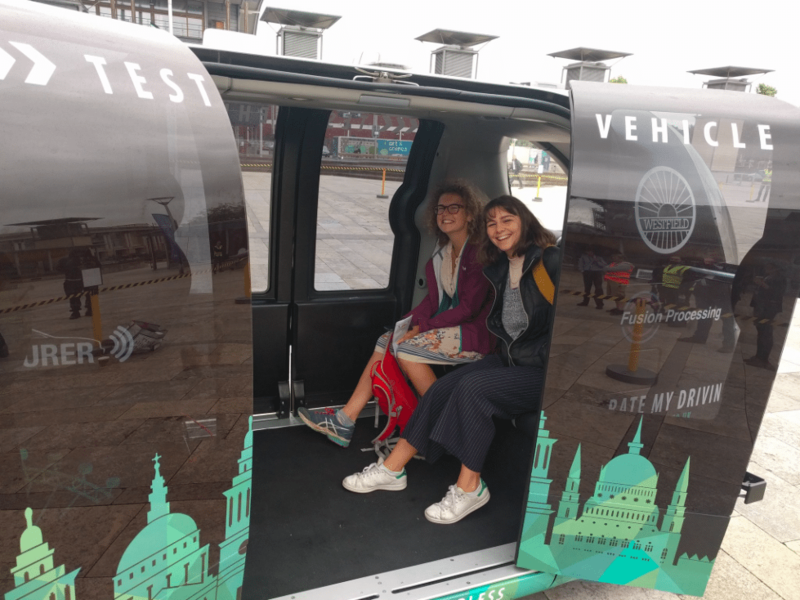 For more on driverless cars in Bristol, you can head to the VENTURER website. You can also follow them on Twitter for the latest updates here: @Venturer_cars.